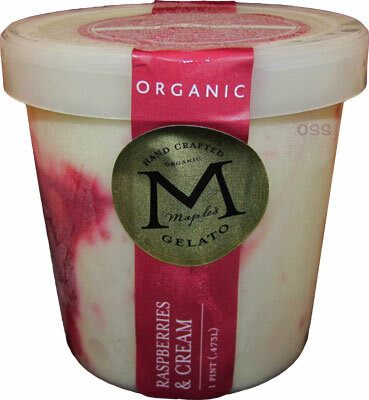 [By Nick] Let's take a look at the safest flavor of the bunch Maple's Organics sent me for free: Raspberries & Cream Gelato. It's no secret that I’m a lover of raspberries. Being described as having a sweet cream base with organic raspberry ribbons, how could this one not be enjoyable to me? While I do like the clear containers, they really ruin the whole element of surprise. That said, I love all of the raspberry action I can see throughout the pint. The sweet cream gelato has almost the same texture that I encountered with their Sea Salt Almond Caramel flavor. Nice and creamy but not as rich. This actually allows the sweetened milkiness of the base to make itself known. While many sweet cream bases tend to be borderline bland, Maple's manages to get a good amount of flavor out of their base with that added bit of vanilla. The raspberry swirls are abundant and add to the sweetness of the gelato. They do have a little bit of tartness to them but nothing overpowering. 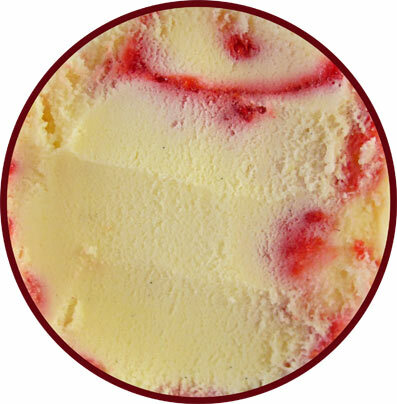 The raspberry ribbons are also well distributed throughout the pint which is a plus. Combined with the base, this makes for a nice light treat on a hot summer day. My only complaint is that I'd like some sort of mix-in. Maybe some granola or white chocolate chips to change up the texture and add a bit more flavor to the overall product. I can easily remedy that myself but it would be nice for it to already be produced like that. Still as is, this is a well-crafted, pleasant gelato that I can see a lot of people enjoying. I'm currently eating their chocolate covered strawberries ans am disappointed. Very icy. Maybe it's due to the store I got it at, but I've had other gelatos and ice creams that have not had issues. The chocolate is almost like the hard shell type that you find on Dairy Queen cones and the strawberries are small shreds and very icy. Guess you could say, I didn't like it. ibagoalie, sorry to hear about your experience. They didn't send me that flavor is I can't tell you if it was a fluke or not. I've yet to experience anything icy from them though. do you still have the container? I technically had a bad experience once but the pint was well past the expiration date (so not maple's fault). yes I do, I sent an email to them. I do like to give companies a chance to make things better.